A few weeks ago I reconnected with a former supervisor. She was a principal who I highly respected and enjoyed working for. Out of all of the administrators that I’ve worked for and with, she was the one who best encompassed the role of “leader”. In an email to me she wrote, “Remember that you have the mind of a leader. You’ve always seen the bigger picture, the way best practice should be implemented.” Wow, that meant more to me than any mark on any evaluation I’ve ever had. It got me reflecting on this question, though; What constitutes the mind of a leader? I began working on my administrative license this past fall. I am taking my courses from Indiana Wesleyan University and the entire program is centered around servant leadership. Being a servant leader means serving your family, your colleagues, the students, the support staff, the parents. One of our assignments had to do with using our gifts and talents of leadership in our careers. Up until then, I had not really thought about being gifted in leadership. Through that process, however, I began to see ways I had been preparing for leadership roles all along. My passion for education was reignited as I moved from the classroom into the role of curriculum director. I learned about areas of education that I never cared to know about before, and I loved it! More than that, I was excited to teach other educators about it. (Don’t spread this around, but I actually enjoyed the whole “transitioning to CCSS” process. I did not enjoy the “pauses” put in place as much, though.) As a pre-Smart board, pre-iPad (three old desktop computers only in my classroom) teacher, I knew little about technology. As the curriculum director I soon discovered my inner tech-geek. Not only did I enjoy the learning process, but I thrived on leading professional development, writing blog posts regarding digital resources, and searching out and sending specific information to individual teachers. Oooh, and don’t get me started on what it would look like when I met up with like-minded educators. It was amazing to talk to someone who “got it”. Still, I didn’t equate any of these activities or my mindset to leadership until this graduate program and then that more specific assignment. It made me think back to the administrators I worked for previously. Some were more boss-like than leader. 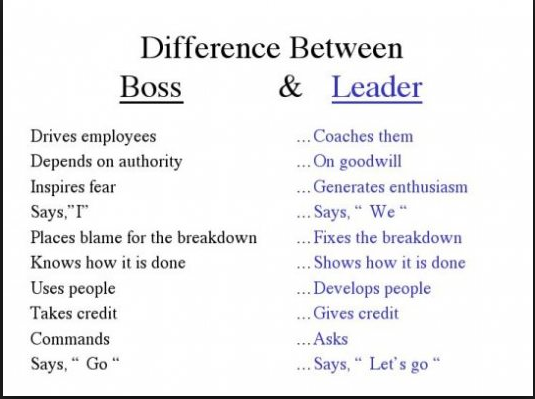 I really like this visual showing the difference between being a “boss” and being a “leader”. Leaders don’t micromanage, they delegate. Leaders make mistakes and learn from them. Leaders admit when they are wrong. Leaders learn from others and don’t act like they have all of the answers. Bosses have to convince others of their expertise. Bosses don’t really care about their employees. Leaders take time to develop authentic relationships. I don’t ever want to be someone’s boss. I am a leader. That is a process that never stops. I am continually learning and growing so that I can be a better leader tomorrow than I am today. What are more leadership characteristics that I missed? What do you look for in a leader? In yourself? This entry was posted in Education, Professional Experiences and tagged leadership. Bookmark the permalink. Thank you for this post! I’ve been considering pursuing my master’s at IWU as well, and a program rooted in “servant leadership” is what I’m all about! I can’t say enough good about IWU’s PLP. I think you will really enjoy that program. Best wishes!